Resettled familiy in Kuchchaveli takes away mosquito nets. 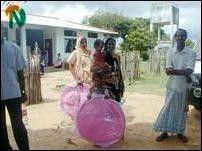 Trincomalee Lions Club, Trincomalee New Century Lions and Trincomalee Leo Club on Sunday jointly organized two events one at Iqbal Nagar and other at Kuchchaveli, two resettled villages in the district to distribute mosquito nets to the needy selected by medical officers with the assistance of village level workers, the sources said. Past District Governor of Lions International in Sri Lanka Mr. Upali Edirisinghe inaugurated the distribution of mosquito nets at Iqbal Nagar and Kuchchaveli. 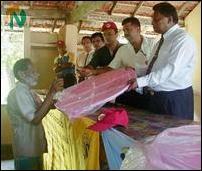 Past District Governor of Lions Mr.Upali Edirisinghe distributes mosquito net to a villager. Next to him is the project co-ordinator Lion Mr.B.Jananranjan of Trincomalee Lions Club. The project co-ordinator Lion Mr.B.Janaranjan organized the distribution held at Iqbal Nagar Muhamediya School and Kuchchaveli Vivekananda Maha Vidiyalyam, the sources said. Three have died due to brain fever, one at Nilaveli refugee camp and others at Morawewa and Uppuveli in the past two months, medical sources said. As the rainy season has started, the outbreak of dengue fever is expected in low-lying areas due to water stagnation, which is the breeding ground for mosquitoes, health authorities have warned. 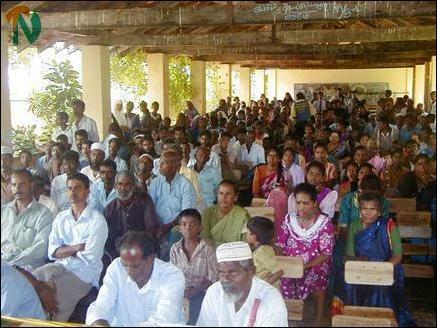 A section of the people present at Kuchchaveli Vivekananda Maha Vidyalaym to get mosquito nets.